I’ll admit openly that I’m a big Star Wars fan. Although I’ve never dressed up as a Stormtrooper or been to a convention, the movies run rather deep with me. I find the Jedi especially intriguing due to their disciplined study of their art and the use of their powers to hold up their ideals. 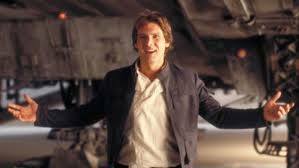 It is almost contradictory that my favorite character in the Star Wars universe is Han Solo. In my house there is a longstanding argument between my son and I about the virtues of our favorite characters. He is a Luke Skywalker fan who tries to sling mud at Solo as if the two were running for president. More than anything I find our debate an amusing way to underscore some character traits that made me gravitate toward Han Solo in the first place. Despite his semi-selfish appearance, he repeatedly proves his value as a friend and leader. Obviously I know that this is a fictitious character in a movie. It is the crossover into the real world through the actor, Harrison Ford, that brings the entire picture together. Harrison Ford was interviewed around the time of the re-release of the original trilogy. He was asked whether or not he believed in “the force”. His comment was “force yourself”. I don’t recall him elaborating any further than that but it stuck with me. If you want to put your faith in mystical energy fields, you are absolutely welcome to do so. However in this world that I have created for myself, Ford’s advice is the perfect transition from the film to real life. Force yourself to do those things that you think are impossible. Force yourself to be more than you thought you could. Force yourself to be a reliable friend and a good leader. Force yourself because almost no one else will.